Birding enthusiasts young and old anticipate the arrival of seasonal birds in their area in their never ending quest to add species after species to their life lists. A discussion of the types of birds they look for in North America starts by acknowledging the world’s approximately ten thousand bird species organized into approximately thirty different orders. The American Ornithologists’ Union (OAU), the institutional standard setter for North American birds lists approximately 2,100 species in twenty eight orders at year. 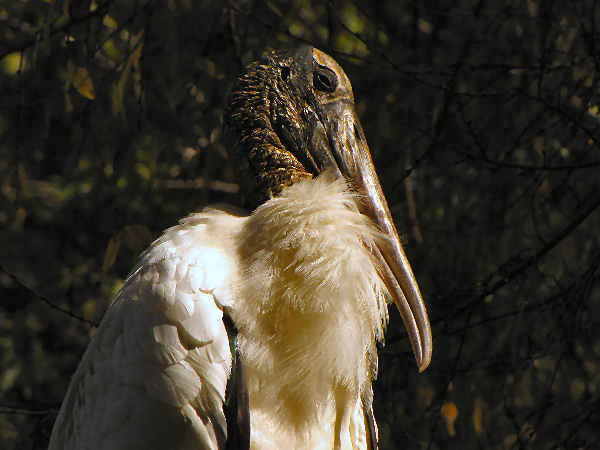 Given the fact that the OAU coverage area extends to Mexico and Central America, their list of North American birds doubles the number of bird species associated with North America proper, the area north of the United States-Mexico border. The American Birding Association (ABA) picks up where the OAU ends, further sorting the OAU list into 969 species with at least an occasional visit to North America proper. Organizing all these birds into a simple presentation starts by noting that almost one-half of North American bird species fit into the Passeriformes order, the perching birds. They are presented in the second and third section. This first section documents many types of birds that don’t get categorized under the perching birds label. Their names are as familiar as the names on the buttons. Hawks, ducks, hummingbirds and shorebirds often share their days with us. Each section provides pictures, descriptions, video and additional information. The ABA lists 38 different Passerine families. 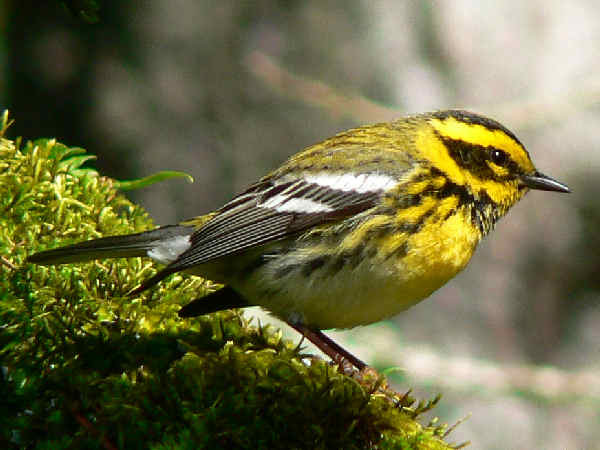 A spring time favorite, the colorful Wood-Warblers (Parulidae), leads the diversity category, with 57 species making at least an occasional or stray visit. Ten separate families tie for the title of least diverse, having only one North American representative. Another eight native North American bird families count two species each. Many birders consider these special birds because sighting one means adding an entire family of birds to their life list of North American birds. Here’s a quick review of some representative species from the least diverse group of perching birds. The links in the box point to more detailed information covering neotropical songbird and other insectivore families. The following section deals with most of the seed eating perching birds. Phainopepia are the only members of a small family of birds (Ptilogonatidae) regularly found in the United States. Collectively the four members of the family (Black-and-yellow Silky-flycatcher, Gray Silky-flycatcher, Long-tailed Silky-flycatcher, Phainopepla) are called the Silky Flycatchers. Like members of the flycatcher family (Tyrannidae), they tend to sit on tree branches, keeping an eye open for insects in the area, then flying out to catch them. Phainopepla are only found in the southern most part of the Southwestern United States. They split time living in both desert and woodland habitat. From a distance, they might be mistaken for other large, black feathered birds such as crows, ravens or grackles. A close-up look shows the male’s distinctive red eyes and black crest. 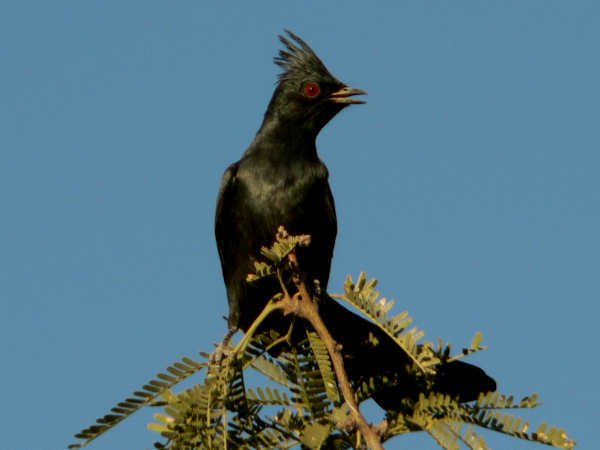 Female Phainopepla have gray feathers with red eyes. Experts tend to disagree over the placement of Bombycillidae species, however, some experts recognize only three Waxwing species: the Cedar Waxwing of the United States, the Japanese Waxwing of Northeast Asia, and the Bohemian Waxwing of Europe, Asia and North America. 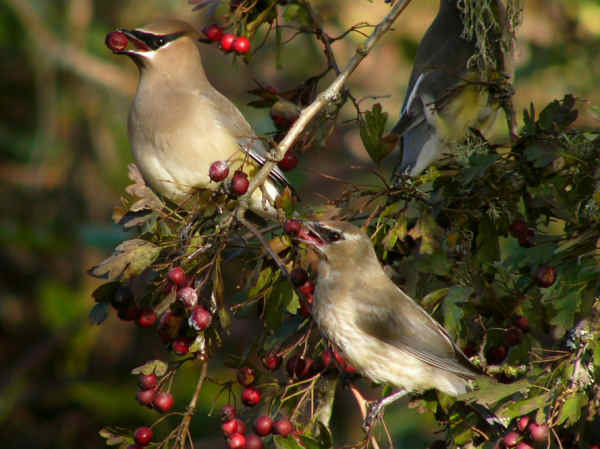 The picture shows a pair of black-masked Cedar Waxwings eating berries. The Bohemia Waxwing also has a black face mask, however, the body and breast feathers are a lighter gray and the head is a rustier color. Cedar Waxwings are the more common species, year-round residents in the North and winter migrants in the South. Again, they often travel in large flocks consuming as many berries as they can find. The facial mask gives rise to the analogy of their being the avian raccoons of the berry world. 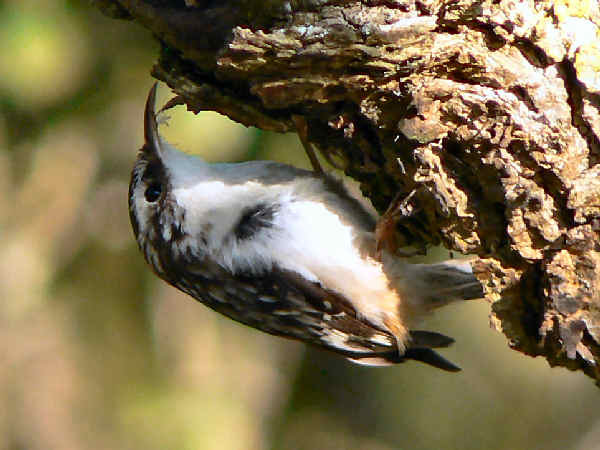 The Brown Creeper (Certhia americana), resides in woodlands across North America. Year round residents in much of their range, in their northern most range, along with mountain areas, they migrate short distances to warmer locations. Creepers tend to walking up and down tree trunks and branches in search of insects and spiders, their primarily source of food. The picture highlights the bird’s brown mottled feathers that easily blend into a tree bark background. Their decurved bill makes them an easily identified species. 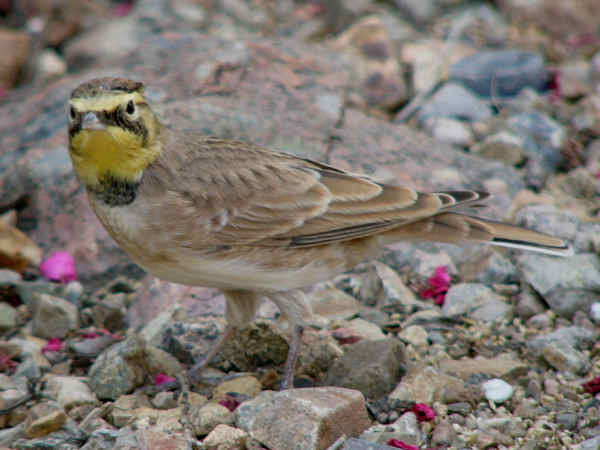 The Horned Lark (Eremophila alpestris) one of two native species in the Lark family (Alaudidae). 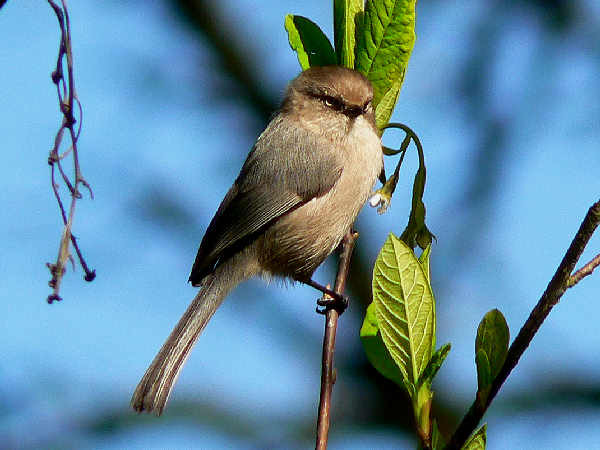 The Bushtit (Psaltriparus minimus), represents the Aegithalidae family in North America. Engineering marvels, they are best know as the birds that create hanging nests, and duplicates, during the breeding season . 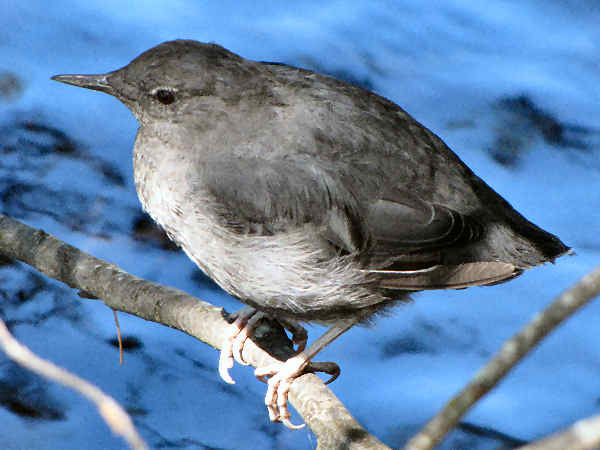 The American Dipper (Cinclus mexicanusa), American’s only aquatic songbird, inhabits cool stream areas of the Western United States. Perching birds can also be divided between the insectivores and seed eaters, although in times of food stress many switch back and forth between food sources. 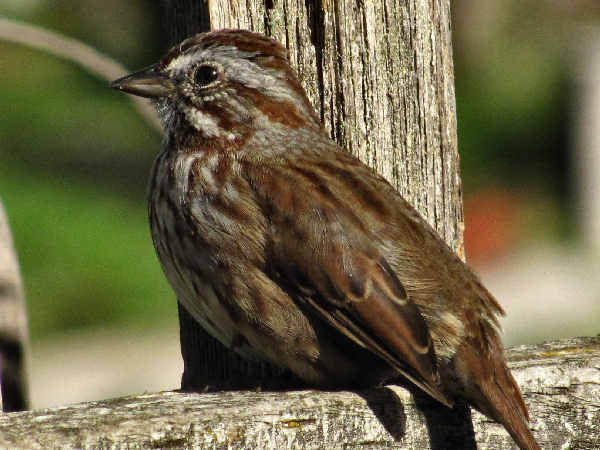 Passerines (sparrows, finches, cardinals, jays, crows, warblers and more), as they are collectively known, are the types of birds commonly called seed eaters, and consequently the most common birds seen in residential areas and backyard feeders. All birders who set up back yard feeders soon come to learn of the natural pecking order produced by the feeder. Larger seed eating birds such as cardinals and jays often are at the top of the order. Sparrows and other medium sized birds feed second. Smaller birds such as chickadees hang around and pick one seed at a time whenever they have the opportunity. Press the feeder birds button to learn more about this group.